MARCE HERZ'S IDEALS ARE TIMELESS! Originator and cofounder of the Sky Tavern Jr. Ski Program (2018-70th Anniversary of the Program). To this day, the Jr. Ski Program remains the oldest and largest nonprofit ski facility/program in the United States. Since 1948, more than 100,000 Washoe County kids have learned to ski and board in the Jr. Ski Program. This is proof of Marce's timeless ideal that ALL children should get the opportunity to ski or board. Help acknowledge her giant contributions to Northern Nevada and Washoe County children. 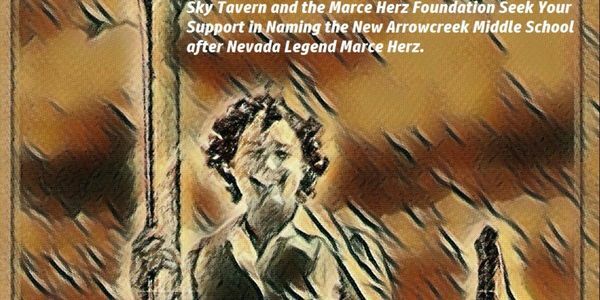 ALUMNI AND SUPPORTERS-COME CELEBRATE THE 70TH ANNIVERSARY OF MARCE'S LEGACY, SKY TAVERN AND THE JUNIOR SKI PROGRAM! WHEN: Saturday Dec. 1, 2018, 5:00 - 8:00 pm. WHERE: The Former Sports Authority by Sams Club, 4813 Kietzke Lane, Reno, NV. Did you know? In the 1950s and early 1960s, Marce's design talent and entrepreneurial spirit resulted in the creation of a successful design business. Marce designed Christmas decorations for her home at 1201 Arlington Ave. People noticed, and this led to 3rd party commissions from homeowners and civic groups. Soon, Marce won prizes in both Nevada and California for her unusual decorations and her parade floats. Demand for her outdoor decorations/designs led to her founding Marce Herz Designs. Did you know? The evening prior to passing from illness in 1964, Marce told her teen son Howard: “NEVER BE AFRAID OF DYING-ONLY BE AFRAID OF NOT LIVING.” Marce’s legacy, the Jr. Ski Program, reflects this ideal. DID YOU KNOW MARCE SAID: “YOU'VE GOT TO BE CRUEL TO RUN DOWNHILL.” This was Marce's unique way of describing the mindset/courage needed to confront the Silver Dollar Derby Downhill. She won the 1949 & 1950 Nev. Ski Championship on this course, a downhill starting top of Slide Mtn. (9700 ft) & finishing just above the valley floor (6000 ft); a harrowing 2 mile downhill with speeds in excess of 65 miles an hour, and raced with no helmets and inferior equipment. We obtained 100 signatures 5 weeks ago at Bobo's. Total with electronic now 151. Please fwd. the link to whomever you believe may sign the petition.